So let's start this post off by saying 2 things: The Wine and Dine Half was my was my 22nd half marathon......and I haven't ran more than 3 miles since March, 2017. I am a seasoned idiot. OK now that I got that off my chest, I must say that I do not suggest my lack of training to anyone. I will be honest throughout this long recap in hopes that others don't make my ignorant mistake. 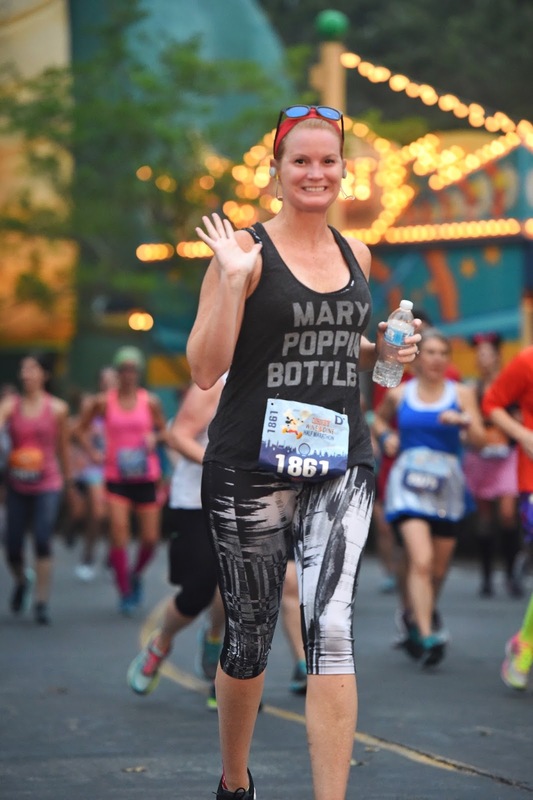 Disney's Wine and Dine Half Marathon is my absolute favorite runDisney event. 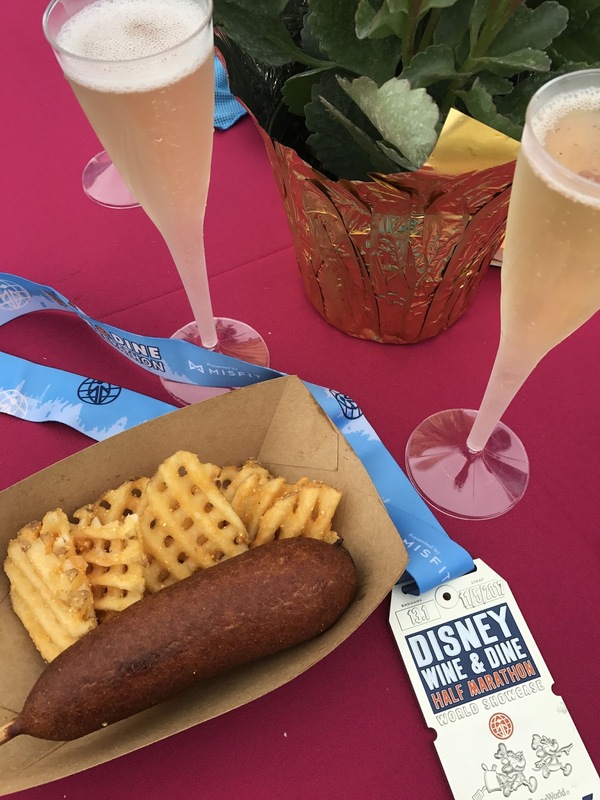 It is a combination of all my favorite things (Disney, Wine, Food, Running) and it is the only race that runDisney puts on which gives runners access into a park for an after party. 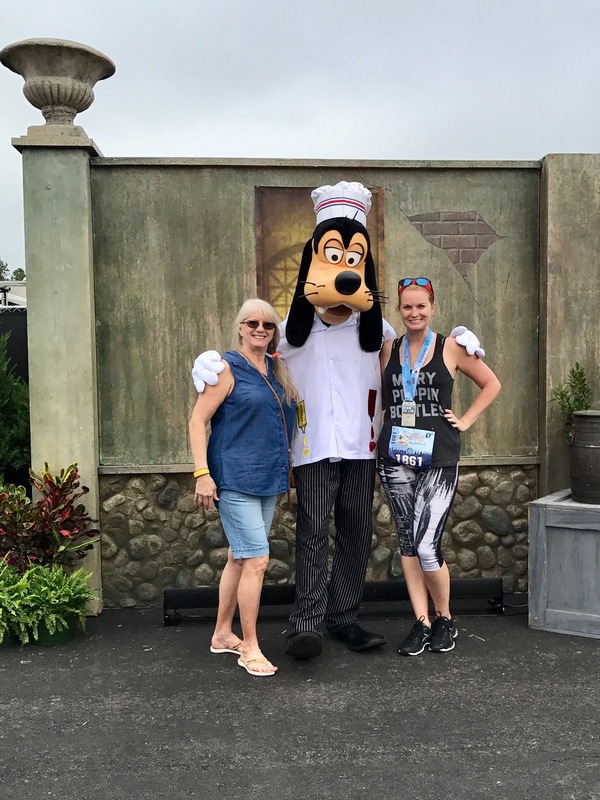 When runDisney cancelled the Walt Disney World Half Marathon in January, my best friend Keri and I switched our registration to the 2017 Wine Dine Half since it is our favorite race to run together.....well Keri ended up getting into the NYC Marathon so I was tackling on Wine Dine Half alone. I had full intentions properly training for this event. Well that didn't happen and I am not going to bore you with excuses. My work schedule conflicted with half marathon training and I will leave it at that. I had to take the red-eye in from Portland to get my bib on time. I was Jet lagged and beyond exhausted. At 3:15am, I was up and ready to go. I read the digital runner guide the night before and I read that the race started at Pocahontas Magic Kingdom Parking Lot. My big mistake for not questioning what I read. I missed an important part - where it said to park at Epcot and take a bus over. I had to turn around, drive back to Epcot, and be one of the final people to board the bus back to where I was just at. This was my mistake, but not having a printed out version of the runner guide really screwed me up and I beg runDisney to bring those back. By the time my coral (D) started, I was in a foul mood. Nothing was going right, I was tired, I was untrained and everything I love about runDisney was annoying me. Next thing I know, it was time to start. I crossed the start line with the 2:30 minute run walk coral and made the decision to stay with them. Being untrained and used to this run walk ratio, I knew this was something that I could accomplish. Within a few steps, I was in a bad way. The humidity was impacting my breathing. I missed the last 8 weeks of Orange Theory due to work travel and I was starting to mentally doubt myself on all levels. We passed a "parade bus" at mile 3.1 and I seriously thought about quitting. Then I thought to myself, Keri will have 23.1 miles to go when she reaches this point. Carry on. 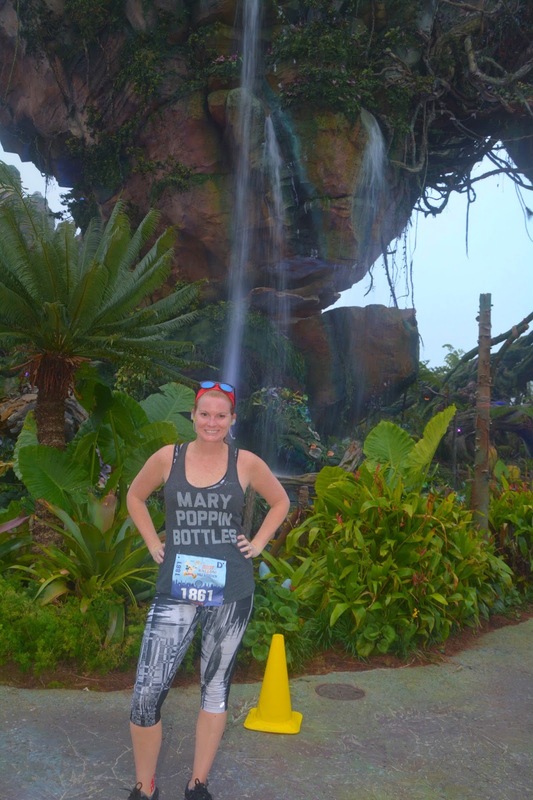 I was very excited to run through Pandora, the new Avatar land in Animal Kingdom. I have only been to Pandora once during a media sneak peek. Upon entering Pandora, I left the 2:30 pace group so I could get some photos. This is where my downward spiral became a landslide. Upon exiting Animal Kingdom, I wanted to quit again....and again...and again. At this point, I had not taken any character photos, so I stopped at the first one I saw which happened to be chef Pluto. I waited in line for a few minutes and when it was time to start running again, I felt positive for the first time all day - OK I can do this. That is when I decided to stop at all the photo stops along the course. The next one - of course - was the one group of Disney Characters I hate....the Country Bear Jamboree. This is somewhat of an inside joke between my mother and I so I stopped, just for her. Awkward photo much? Next up was the penguins from Mary Poppins. 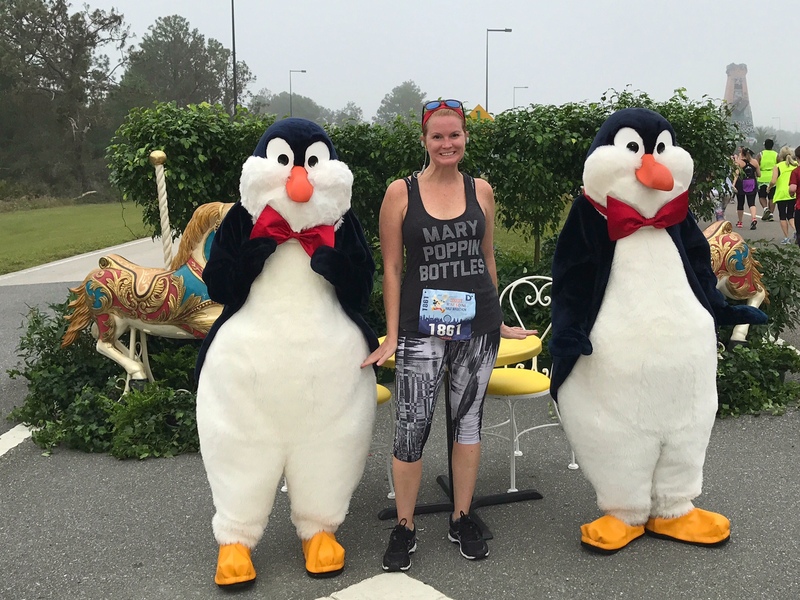 Given my shirt said "Mary Poppin Bottles", I was really hoping for a photo on the course with her, but penguins I will take. 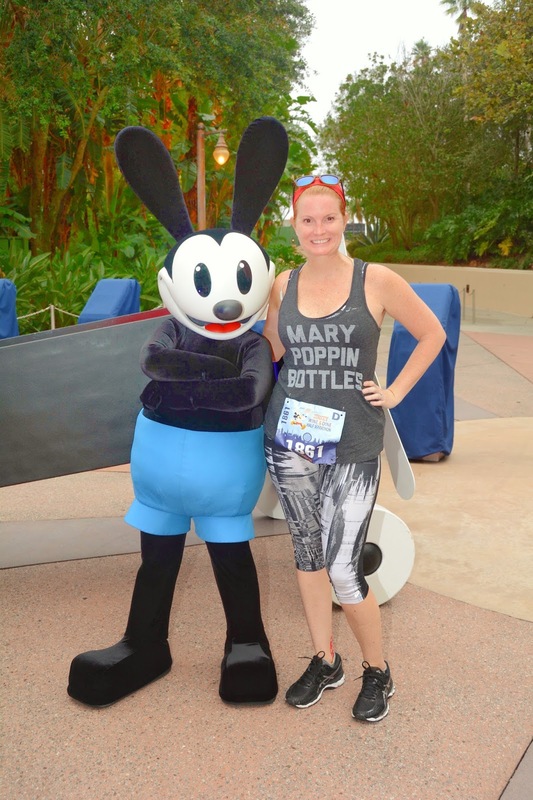 When I entered Hollywood Studios, I saw Oswald the Rabbit - and was stoked. I have always wanted a photo with him! On to the next character, which was tourist Genie, I skipped him as this photo already belongs in my runDisney collection. Once leaving Hollywood Studios (which is beautifully decorated for Christmas, already), I found myself with the 3:00 run walk pace group. By the way, I was walking pretty much at this point. Hating life. This group was doing 30:30 which is what saved me during the Inaugural Dopey Challenge. I decided to stay with them through the end - that was until I saw Remy & Emile from Ratatouille which is my runDisney bucket list photo. I was grateful for that pace group as I would've ended up walking the last 2 miles if it weren't for them. 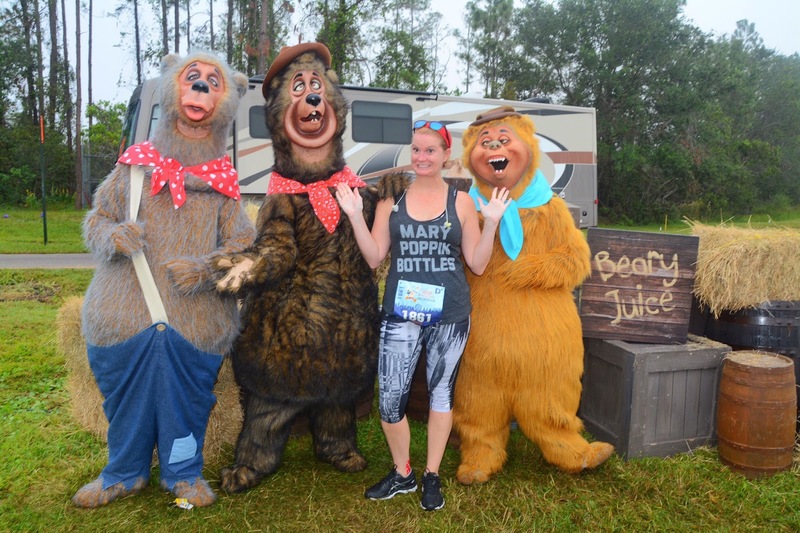 After my photo with Remy & Emile, I ran pretty much the rest of the course. My Mom was at the finish line - and believe it or not, this was her first opportunity to be able to watch me cross the finish line since my first 5K at Princess weekend in 2012. I found my Mom, she graciously stood in line to get me a corndog (at 8:45am) from the Fantasy Fare Food Truck while I stood in line to get us 2 glasses of Moet Champagne. Cordogs and Champagne yall! Then we took a couple of photos together. It was a treat having my Mom there at the finish line. Especially considering the mental and physical condition I was in. This race was not fast. I don't even know (or want to know) my finish time. My accomplishment was only the fact that I finished 13.1 miles totally untrained (although it is an ignorant accomplishment). I learned a huge lesson in terms of training. Our next race is the Key West Half Marathon in January and you can guarantee I will be training over the next few months! So our bib numbers were only one number off from each other. I was 1831! And we were in the same corral, ha. My plan was also to stay with the 2:30 group and I ended up finishing with E corral. The humidity absolutely wrecked me. I couldn’t replace my fluids quickly enough and ended up sick Sunday afternoon! I’m so sorry you aren’t totally happy with your experience, but I empathize because I felt the same way! My recap will be up tomorrow, and sounds a lot like yours in parts!